Monty Python’s Spamalot is set to gallop back to Sunderland Empire for one week only from Tuesday 10th - Saturday 14th October 2017. Winner of the 2005 Tony Award for Best New Musical, the hilarious musical was written by Python legend Eric Idle, with a fantastic score co-written by John DuPrez including Always Bright Side of Life. Lovingly ripped off from the hugely successful 1975 film Monty Python and the Holy Grail, Spamalot is a riotous comedy full of misfit knights, killer rabbits, dancing nuns and ferocious Frenchmen. Join King Arthur as he travels with his hapless Knights of the Round Table on a divine mission to locate the illusive Holy Grail with uproarious consequences. 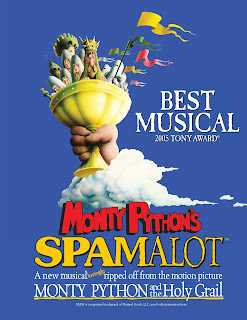 Produced by the award winning Selladoor Productions, producers of Footloose, American Idiot, AvenueQ and Little Shop of Horrors this brand new UK tour of Spamalot will have audiences rolling in the aisles.